An attempt at a conventional review of In-n-Out Burger would be futile and even a bit vapid. Duh. Obvious. So instead, we’d like to tell a series of stories about why it’s such a special place, both in its westerly locations and, of course, in our hearts. 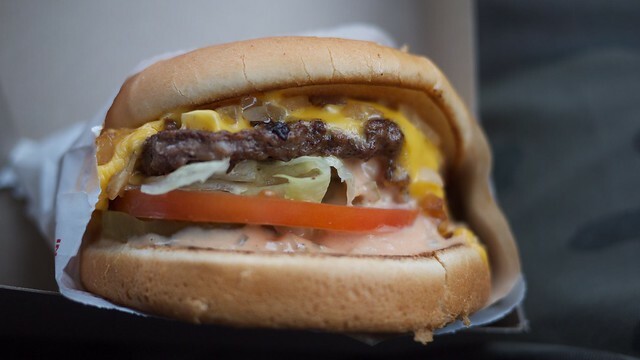 Those of you that live in California, Arizona, Utah or wherever else they’ve managed to open one might not fully appreciate what In-N-Out Burger means to us. The very first moment I step off a plane anywhere on the West coast, the very first thing I want to do is visit In-n-Out. The last time I was in Las Vegas, I had to endure being driven right past the one on Dean Martin Drive a good dozen times over a period of four days without being able to visit once. It was painful. My first ever In-n-Out burger was in the Spring of 2004. I was in LA ‘revising’ for my finals and had made a small list of must-visits since this was the first time I’d been back to the west coast since the mid nineties. The two places at the top of that list were In-n-Out, any location would do, and much more amusingly with hindsight, Krispy Kreme. Remember back then that KK hadn’t mutated into the Franchisosaur it’s now become. We drove all the way through several nastier neighbourhoods (ie. ones generally mentioned in Ice Cube lyrics) to seek out the hot baked goodness. It was one of the proper locations that let you pick up a free one hot off the conveyor belt. It was amazing; my first proper American doughnut experience. But I digress. Back on topic. Heading North on the 101 towards Burbank I spotted the Cahuenga Boulevard In-n-Out, swiftly crossed about four lanes of traffic and parked up. Exciting. I remember the shock of the menu. I knew nothing of the secret menu in 2004, so I ordered a Double Double with fries. That burger was as Proustian as can be. I could barely comprehend how perfect it was. And I had change from $5. Several hours later, on the way back from Van Nuys (I have no recollection why I went there), I pulled back in again and had another one. It was totally identical. Unbelievable. For a short while, Five Guys were being uttered in the same sentence as In-n-Out. Personally, I don’t think they really compare. The sheer aggression of the Five Guys’ expansion across the US is McDonaldsian in scale and I think the quality is suffering as a direct result. In-n-Out don’t do that. There is no UK franchise equivalent that can engender the same level of childlike wonder and anticipation. The fact it’s so many thousands of miles away sweetens the anticipation, even after dozens of visits. It’s effortlessly Californian and we would like it to stay that way. More In-n-Out Diaries are coming soon.